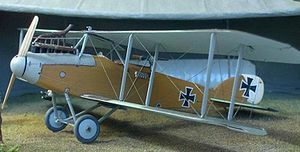 The Albatros C.X was a German military reconnaissance aircraft which saw service during World War I. It was essentially an enlarged development of the C.VII designed to take advantage of the new Mercedes D.IVa engine that became available in 1917. Unlike the C.VII that preceded it in service, the C.X utilised the top wing spar-mounted radiator that had first been tried on the C.V/17. Other important modernisation features included the carriage of oxygen for the crew, and radio equipment. Grosz, Peter M.. Windsock Datafile 114 Albatros C.X. Berkhamsted: Albatros Productions Ltd..
Albatros C.X Pictures and Albatros C.X for Sale.